SLEEPS UP TO 19 - min 14 adults for sole occupancy or can take rooms only. 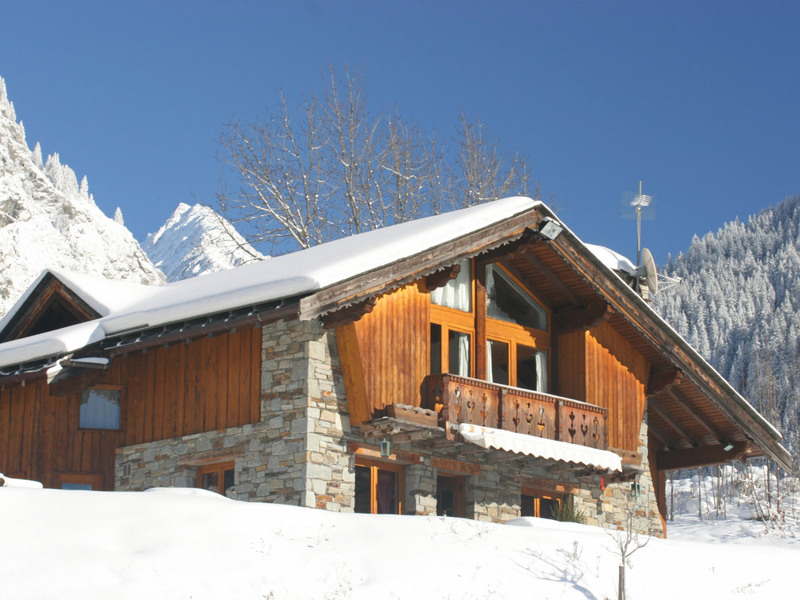 Chalet Marmotte is built in the local style with chunky, textured walls and rustic beams that were rescued from an original 17th century farm. 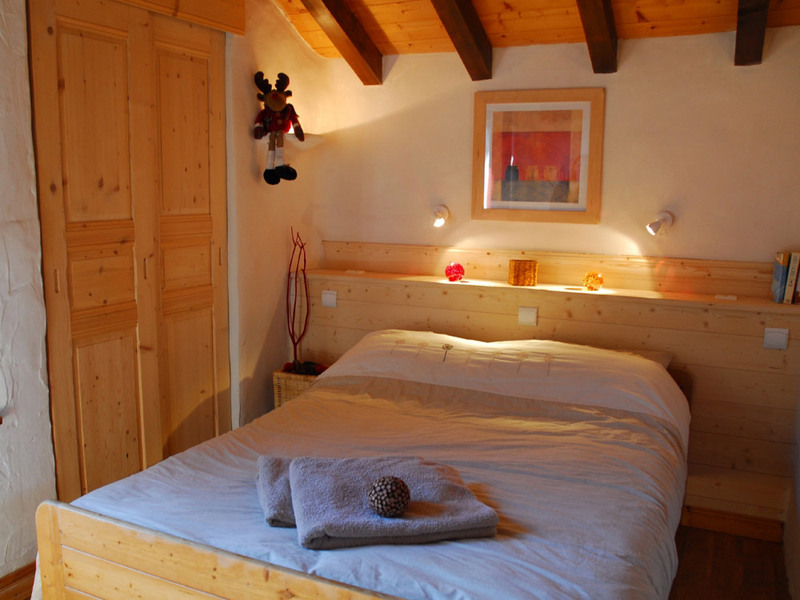 One of the nicest things about this chalet is how homely and cosy it feels when you first walk in, with its mix of honey coloured wood and warm colours used on the walls and for the curtains and upholstery. 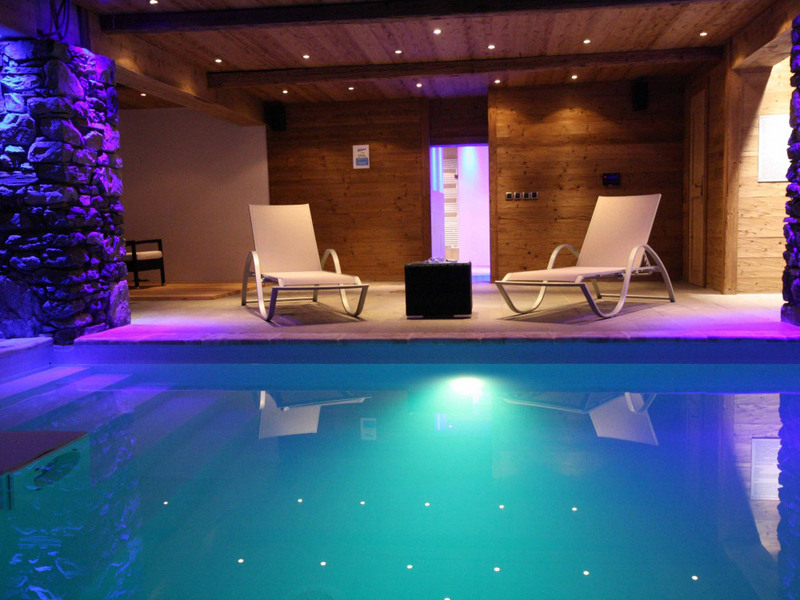 The rooms are spacious, most with en-suite showers while others have balconies with fantastic views overlooking open snow covered meadows, the wonky church on a hill and across in the distance to the twinkling lights of Courchevel. There is a large living and dining room where there is plenty of space for guests to socialize in smaller groups, or together, chatting, drinking, playing games, listening to music and watching TV. 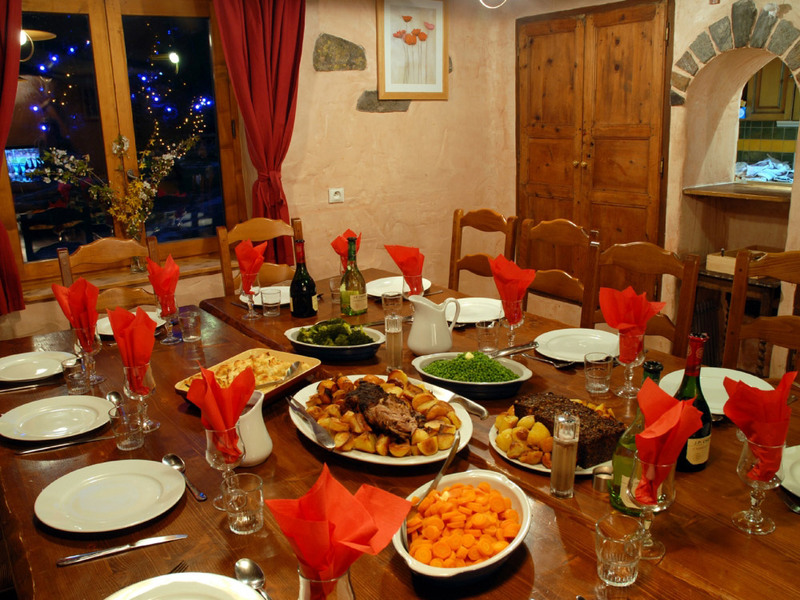 It is more home-from-home than chalet style hotel and the excellent food that we serve is delicious and plentiful and reflects our personal enthusiasm for food and cooking. You can’t beat the smell of freshly baked cakes and a crackling log fire to welcome you in from the cold. We can guarantee you won’t want to leave at the end of the week! After all the food and exercise, you can relax aching muscles in the swimming pool, sauna or hot tub, and for the more energetic, you can have a game of table tennis or pool in the games room next door - also a good place to send any over excitable kids! 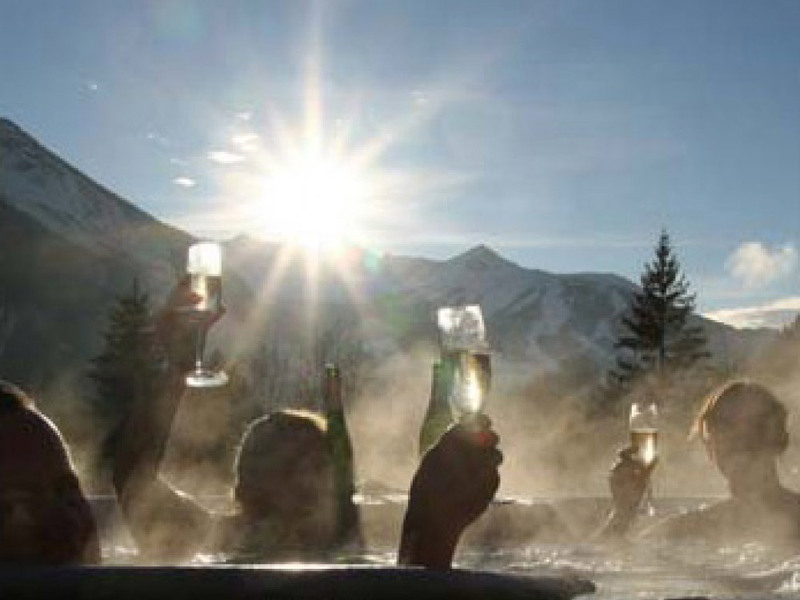 Either fill the whole chalet with your own friends or if you like to meet new people, you can always share the chalet with other groups. The cable car and pistes are just a 5 minute walk and at the end of the day’s skiing you can leave your equipment in our ski store in Centre Sports right at the foot of the lift. 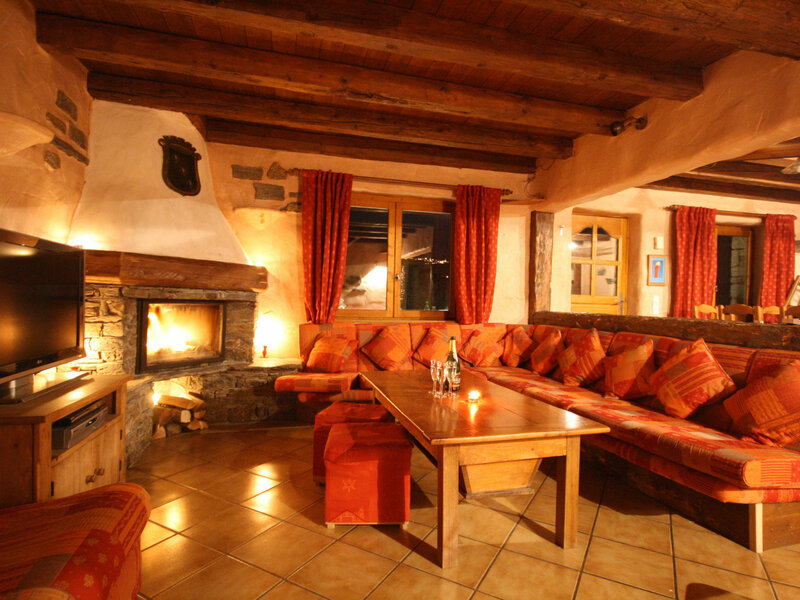 You can then wander back to the chalet in your normal shoes, browse through the village shops or pop into a bar at your leisure. As everything in the village is just a short walk, no cars are needed in resort. Other nearby attractions: Olympic Bobsleigh (La Plagne Centre); Carting on ice and night time luge run (Courchevel 20mins drive); night time skidoo, swimming pool, sports centre (Pralagnon, 20mins drive). We are able to book these activities and arrange transport. Families welcome. Groups welcome. Bedroom 1: master double with en-suite shower & basin. Bedroom 2: twin with en-suite shower, basin & WC. Bedroom 3: twin with en-suite shower & basin. Separate WC. Living Room: 2 large savoyard corner sofas, a third sofa, wood burner, coffee table; sat tv, dvd, playstation II, stereo, Wi-Fi internet access; under floor heating; steps up to 1st floor; front door opens onto covered terrace with bbq, picnic table and great views; half height wall separates dining room. Dining Room: dining table with 20 chairs; serving hatch from kitchen. Separate Kitchen: for our chefs! Garden: large, sloping garden, ideal for tobogganing, leading into meadow, bounded by woods and stream; bbq & large picnic table. Childrens play area: with swings and slide. 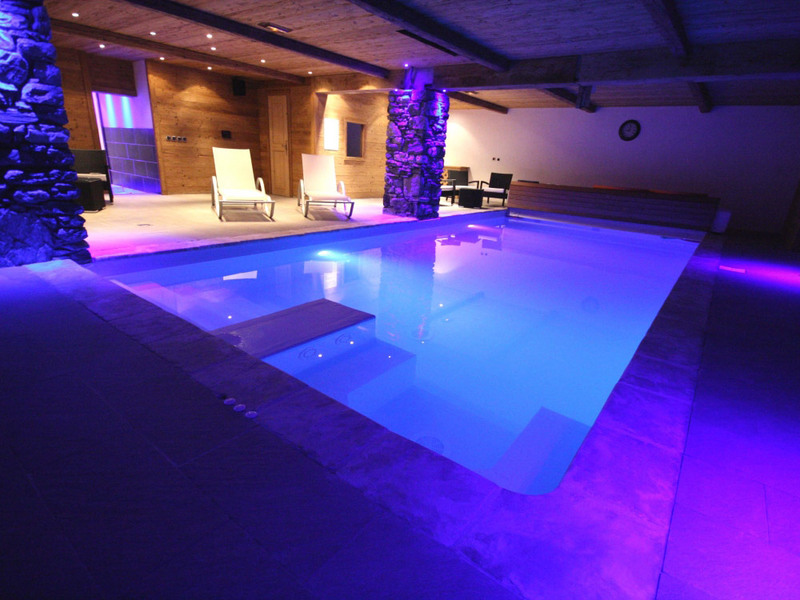 Shared Indoor Heated Pool, Hot Tub: built into terrace (‘Machu Pichu’ style!) in front of chalet with delightful views. Private Parking. Bedroom 4: double. Bedroom 5: twin with french door onto balcony. Bedroom 6: double with en suite shower with French door onto balcony and internal stairs up to Mezzanine Bedroom 7: 3 singles. Bedroom 8: twin with en-suite shower, basin & separate WC with internal stairs up to Mezzanine Bedroom 9: 2 singles. Separate WC. Shower Room: shower, twin basin & WC. Games Room: pool table, table tennis table, darts, stereo. Sauna Suite: sauna, shower, wc. Laundry Room: washing machine and tumble dryer. NOTE: Annexe facilities shared with sister Chalet Sapiniere and Apartment Flocon. A credit card swipe is required either when making your payment or upon arrival in resort. Prices are per person per week and include 7 nights chalet accommodation and use of all facilities including indoor swimming pool, outdoor and indoor hot tub, sauna, games room; full breakfast, afternoon tea and homemade cakes and four course evening meal with wine and cheese board; bed linen, towels and final chalet clean; heating, hot water & electricity; local tourist tax; firewood; wi-fi. Staff have one day off. We run a high quality and varied international menu and cater for virtually all requirements (vegetarian, vegan, allergies, earlier meal times for kids etc). Child discounts also apply, please confirm with us, but generally they are as follows: u.14yrs £100; u.8yrs £200. Note: if you would like to hire the chalet to yourselves but under fill it, empty bed supplements may apply.